Photography – Avoiding "Watchful Dragons"
Sometimes our world offers up images that really are stranger than fiction. Photo taken by Andrew Biraj. I don’t know why, out of all the other photos I looked at, this one stuck with me. When I first saw it I didn’t think, “Now, that’s a pic I can blog about. The title will read ‘Stranger than Fiction. '” I looked at the rest then left my computer for a while before coming back and finding it again. It’s like a dream. That one image. An odd, hazy sort of dream half remembered. 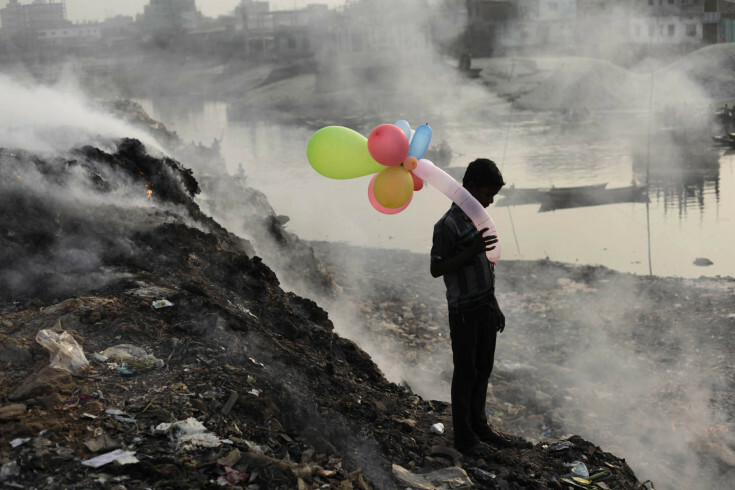 A boy grips a cluster of balloons and stands in the middle of a world of smoke and waste. (That would have been my caption). It’s one of those dreams from which you wake somehow still emotionally invested in a story you can’t recall. Who was that boy? His features are indistinct. You can’t remember his smile or the color of his eyes. But you have the color of his dazzling balloons. You have the smoldering ground he stands on. You can almost smell it — the sick and sulfur smell of that world. Sure. he did. But I caught myself thinking about that kid. Nothing distinct. Just thoughts about who he was and where he was headed. From the picture it looks like his reality is stranger than my fiction. Maybe that’s all we need to understand.